Have you ever had a conversation with a Red Tailed Hawk? As a conversationalist this Red Tail is much like my teenage son, if he’s hungry don’t bother, but in the right time and mood he will share something worth the wait. One of the blessings of living most of my life in the country is getting to know the Earths creatures up close and personal. Red Tail’s story is one of many touching experiences. This is hawk country, open field and ponds, heavy woodlands, streams rivers and when you are a hawk, hungry in a hurry a small highway easy picking as small animals try to make the dash across. So our skies are as busy as the sky over Chicago’s O’Hare airport. There is a large group of Turkey Vultures, the diving run of the Peregrine Falcon, the twice yearly congestion of the Canada Geese in migration, there is occasional Osprey and Eagle sitings, and the smaller Sparrow Hawk maintaining the Sparrow families to a tolerable presence. Then there is Red Tail, he is the most verbal of the mighty fliers and the one who soars to pin point height and comes streaming back down to slide over the tops of the corn tassels and lift again on the next updraft. I could watch his flight all day. Red has a sad mournful cry, he calls out on occasion always hoping to find an answer. He came to our neighborhood as a youngster in new territory and called and called never to have a friend answer back. Food and territory plenty but friends, scarce. I answered one day when his particularly mournful cry caught my attention as I did barn chores. He circled back wide and low and looked. He seemed to recognize finally that it was not another hawk , but someone saying hello anyway. We spoke his call back a forth a few times as he circled and tipped to look at the sounds source, a peculiar sound for the human form to emit for sure. After those few minutes he tipped his wing, and flew off in search of breakfast. Days passed with no sign of Red, or I was not out when he was over the farm but on the next flight when I heard his call I quickly went out and let my whistle ring on the wind and carry to him. His wing and shoulder dropped and he gracefully spun to the side and dropped so low I could have counted the tail feathers. He swooped up and away and circled back to look again. It was almost as if he was saying “oh yea the human there knows my language too”. After a few passes and a shared conversation of a minute or two he was on his way. This scene was repeated many times that season. One day I stood in the driveway, right in the middle, speaking with him in the high piercing whistle that haunts the sky, when he swooped in my general direction again and I got such a view of his stunning plumage. His tail dropped and he pulled up to light on the branches of the old apple at the corner of the yard and driveway. He called to me and I stood frozen still and answered. He cocked his head side to side repeatedly trying to make sense of this human form speaking. He hopped to another branch and called again and again I gave the answer. I hoped I said nothing offensive in my attempts to speak with him but made no motions until he again lifted off. Through the fall he came more often, spoke more and circled low and perched on occasion. Sometimes I kept right on working pushing my wheelbarrow to and fro as I cleaned stalls or carried hay to horses and let the shrill conversation lift to his ears. 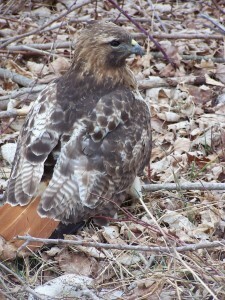 Now I referred to him as my Red Tail friend and was pleased with his allowing me these little glimpses into his life. Some days I would see him but he had no time for me he was hunting and hunger kept him circling looking for that next meal. I understood there is work to be done by us both we can’t always stop and sit for a chat. Winter passed and the fifth season of New England was upon us, the one season I detest the most with little hopes except that it pass quickly – mud season. The only uplifting thing about mud season is that it usually coincides with sugaring. The annual collection of Maple Sap for syrup that heralds the end of winter and brings joy to my heart that soon it will be to warm for sap to run! In this particular year I was working with a group of children from the near by small city. On our last day together we were going on a field trip to see a sugar house my neighbor owns. The plink plink of sap dripping into buckets for demonstration of the old way of collecting was a reminder of my childhood. The modern green tubes webbed through the woodland carry a flowing stream of sap to the sugar house,this replaces the slow labor of collecting bucket by bucket. We had a fine field trip and all were in the car on the return trip to school when I passed through the place called Pleasant Valley. From Pleasant Valley you only need to cross over the highway and you are in city, farm one side city the other and the children’s school just over the line. I was right there when I saw the form on the side of the road. I said nothing with the small children in the car but hurriedly drove the last bit and left them with their teacher at the door, said I would explain later and my son and I left in a hurry. I drove back the short way and pulled off. Sure enough it was Red Tail and it appeared he had been hit by a car. The scene was easy to sort out a dead Cardinal bird was in the street and he lay half upright on the leafy verge. My son snapped the picture (above )from the car as I tried desperately to reach a friend who is a bird rehabilitator. Argghh! No cell service in that spot. I backed up the road a couple hundred feet, none there . We will have to do something ourselves. My son gave me his flannel shirt. Another car pulled up. They had seen him too and drove to where they could get cell service the same plan in mind. There was someone coming with a cage the injured but alive Red Tail had a chance. I told her it looked to be my “friend” she didn’t question the relationship. I said I thought wrapping the shirt around him would secure the wings like a splint in case they were broken. She had reached a bird rehab a few towns away that would be waiting for his arrival. I let my shrill Red Tail call out a couple times and he looked less alarmed and dazed. He tried hopping a few more feet from us but I called again and again, he stopped and looked. I approached very slowly and soon we had Red wrapped in flannel and in our arms. There is nothing to holding a Red Tail Hawk, they weigh nothing, just wind and feathers and a beady little eye that looked me over. I held him close the couple of brief minutes until the car and cage arrived. He was secured in the cage and off they raced to the rehab, the precious cargo wrapped in a shirt and my prayers sent that he make it. We even put his hard earned pray, the Cardinal that was to be his lunch in the cage so they would have his meat if he could eat later. Waiting was hard but eventually a call came, the rehab thought he only had a concussion, he was one lucky bird! They would keep him a couple days to be sure he was stabilized then bring him back and release him. I was ecstatic my friend would be back and well again! About a week later I had a call from my rescue acquaintance. The rehab specialist had released the Red Tail at her clinic ( also a vet) he was better and another emergency had come and there was no time to do anything more. He was beyond the bounds of his home turf the vet couldn’t tell us if the bird would return or adopt the territory it was now in. I waited wondering if the call would ever fill the sky. I was content knowing it was healthy and safe and that was good but I missed the special feeling of having a conversation with wind and feather. 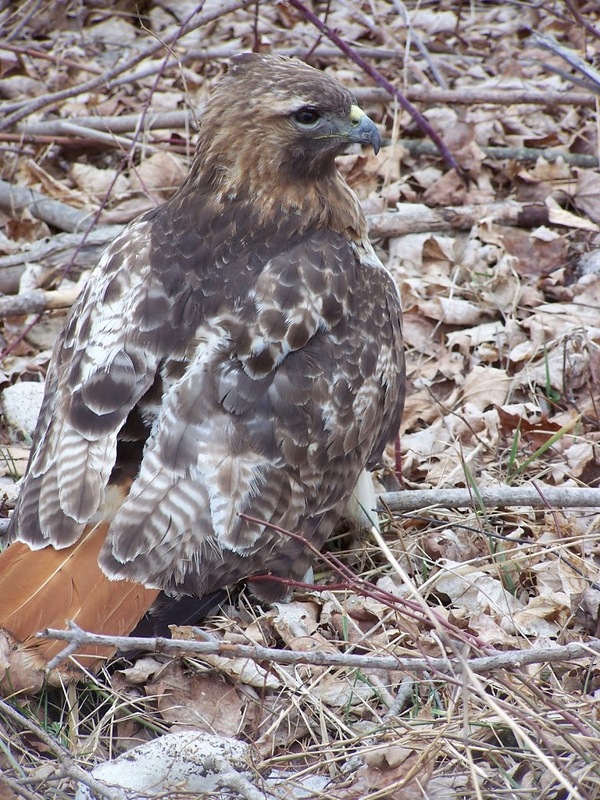 6 weeks passed and a call from the rescue friend to inquire she was thinking of the Hawk, had I seen him….no. The very next morning as I was out at the barn cleaning stalls a familiar call pierced the sky in jubilation. He found his way home!!! I can only imagine his making wider and wider circles looking for a familiar scene to lead him back. Six weeks of searching and looking over the woods and rivers of Eastern Ct. and he finally had seen the familiar skyline and rocky outcroppings of the farm he called home. He swooped into the barn yard in celebration and lifted high against the sun and disappeared into it. I tried to look but it was so bright. I looked all around then heard the cry form the other direction I spun and saw him coming across the long field and only a few feet behind a mate. There was conversation in the sky and I called back. He came and perched on his apple and looked at me but the mate chose a tree on the far side of the pasture, tentative and unsure of befriending the human in the barn yard. I called out and he lifted and tipped a wing as if to say thanks and they rose high on a warm updraft and disappeared. I see Red Tail his wife and the kids on occasion. I think they use the double territory now and hunt a far 30 mile circle between where she was raised and where he was at home. They come to visit now and again and I hear the call in the sky. Red or his family circle the farm. On occasion I see them tip a wing and I am reminded of the gift I was given, to hold a bit of wind and feathers once.